We stayed in a 2 bedrooms apartment, very conveniently located near Sharaf DG metro station, easy to travel around if you are not driving. Rooms are big and clean. They make up room daily unlike Airbnb. Staffs are friendly but not very experienced in guiding us on places of attractions. Overall, very happy with this apartment hotel. Highly recommend. When I booked I was concerned that the outside picture of the hotel was not very nice. I was very surprised when I arrived. Lobby spacious. Staff friendly. Rooms a great size with kitchen. Clean and wort the money. Location is absolutely perfect for the metro. Wish I had booked for longer stay. It is near the metro station, can even walk to Mall of Emirates, closer to the desert safari location and not far from Burj Al Arab hotel. Apartment is sufficiently equipped, with a laundry machine. There are a number of eating places around and several supermarket/grocery options nearby. Only downside is no complementary coffee ad tea, and no detergent for washing. Had a pleasant stay. The apartment is near the Metro station with a lot of amenities such as supermarket, 7-11, carpark and several restaurants. There are also car rental companies in the vicinity. Staff were friendly and switched us to another room when he saw that we are a party of 5. Highly recommended if you are looking at Budget friendly apartment. Nice location and centrally located. Away from the main road by a lane so the traffic noise is very minimal. Less than 150 metres from the Sharaf DG metro. Cabs can be easily found and hotel will hail local cabs for you also if needed. The lady at the Travel Desk was very helpful as were the staff at the reception and the housekeeping staff. They showed us where everything is and how to work them properly. We had the 2 bedroom apartment and the rooms were spacious and could accommodate 5-6 people easily if need be. Some kitchen equipment were missing from the rooms. We had 3 rooms and all of them had some item or the other missing. Equipments like a strainer was also not available in the kitchen. Supermarkets were just behind the hotel as were a few restaurants so it's conveniently located. The Mall of the Emirates was also close by. Around 12 AED by cab or 7-10 mins walking. You could also go there by metro. All in all, a good place to stay if you're in a medium group. Pros: service was good and we did not even have to ask to clean the apartment they used to do it. 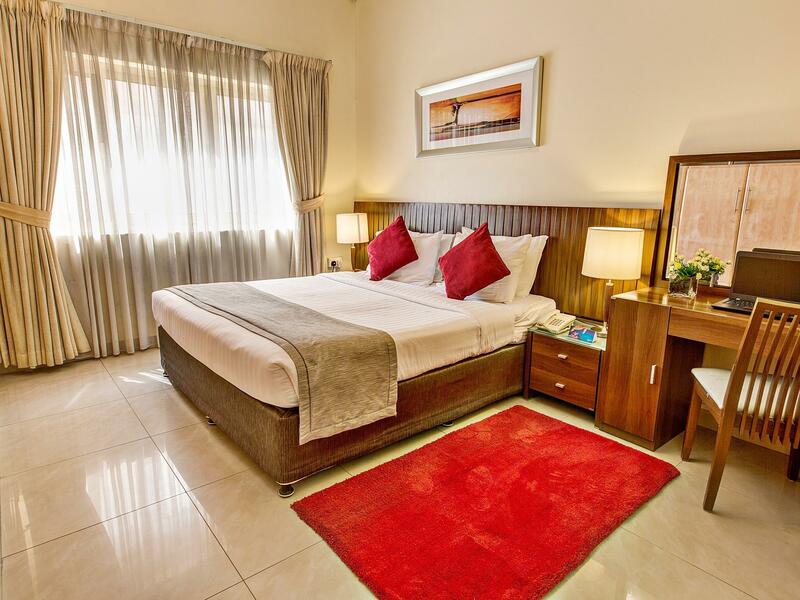 It is near a metro station which is great to get around Dubai and keep the cost down. There was everything near walking distance like supermarket,restaurants and also chemist.Apartment is spacious. Cons: There is only one could the mattress be updated to a better quality mattress, maybe it is only me as I work in furniture that was the first thing I noticed. The rest of the furniture was good apart from the mattress. Standout: Service was standout any staff was willing to help and guide us. Will visit again hopefully to sleep on better mattress. The staff were incredibly helpful, the pool and rooms were very clean. The location was spot on, a good distance from all the key sites, plenty of fast food and supermarkets nearby. The metro was really easily accessible and taxis were easy to organise.. We travelled with three young children and will most certainly be back. Good loxation, Excellent Facilities, Good and coperative staff and afterall at very reasonable price. Only lacking thinf us tge Inhouse Resturant for Buffet Breakfast. Kindly add a Restaurant with Buffet Breakfast option. All are awesome, we enjoyed the entire stay. UPON CHECKIN A WARM WELCOME DURING STAY ALL THE STAFF WERE APPROACHABLE FOR ANY KIND OF NEED, LOCATION 15 MINS WALKING DISTANCE FROM MALL OF EMIRATES AND 05 MINS FROM SHARAF DG METRO STATION. 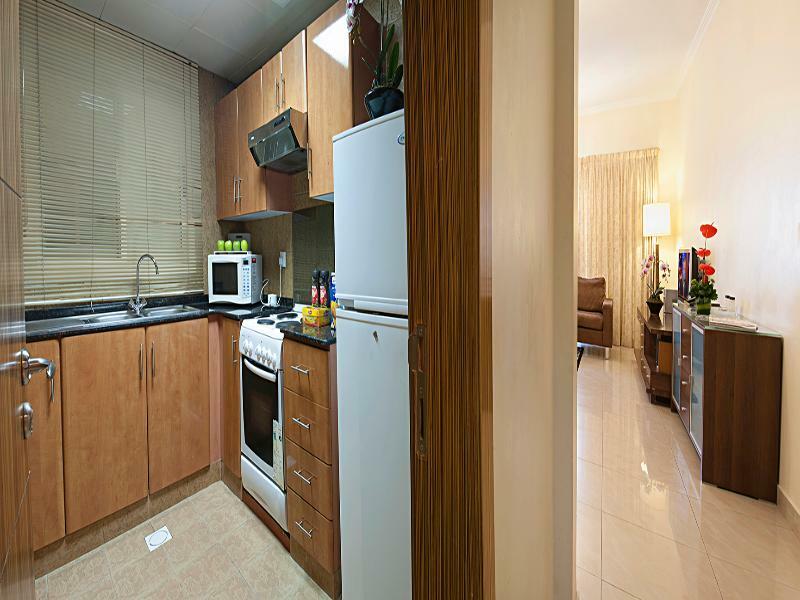 KITCHEN IS FULLY EQUIPPED WITH ALL BASIC EQUIPMENTS. OVERALL EXCELLENT APARTMENT. I WILL REVISIT AGAIN..!!! This was our 2nd year in a row staying here. Staff are fridndly, rooms are cleaned daily and gym/pool is well equipped. Also the metro tram station is about 50metres away. Will be staying here again for our next visit. We booked their 2BR apartment for 4 at around 460 AED a night. The place was bigger than what we expected. There was a bathroom on each room and a half bath near the dining area. The apartment looked clean and well maintained except for the bathroom that looked a bit old because of the bathtub but no biggie. 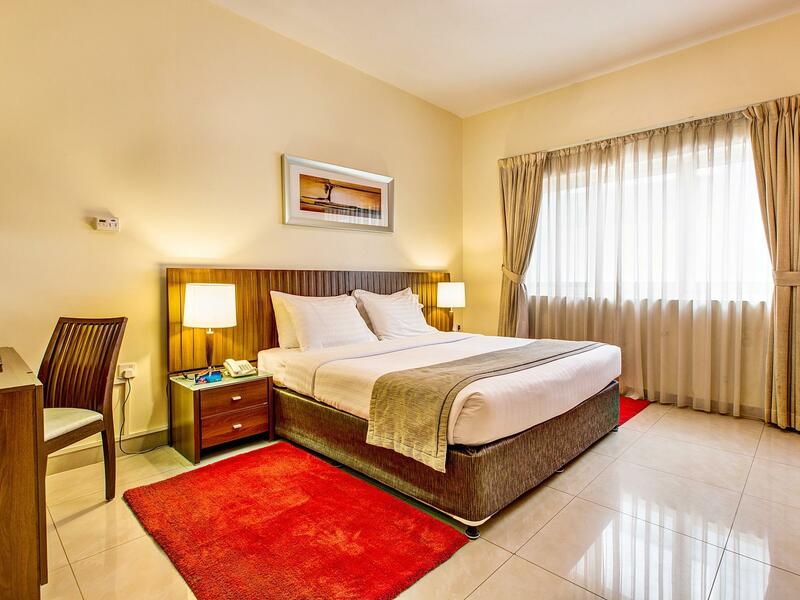 The hotel is just 1 block away from the sharaf DG metro station. 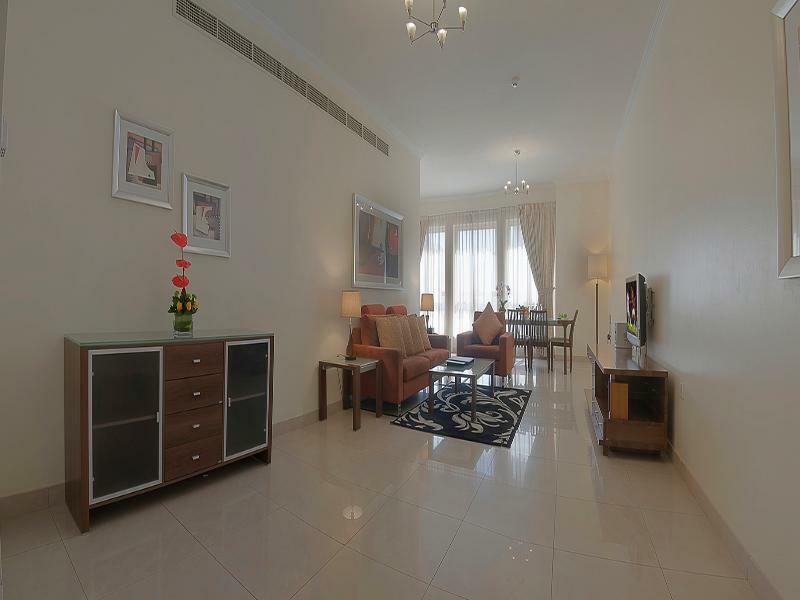 It's only 1 station away from the mall of emirates and few stations away from the dubai mall and dubai marina stations. The staff were very friendly and helpful. They assisted us in getting a taxi and in making a reservation at Emirates Palace. We stayed here for 4 nights and had a great stay. Would recommend friends to stay here and would book here again if we go back to dubai. The apartment was of an excellent size and very clean. The staff were very helpful and also despite the hotel being fully booked they checked us in as soon as a room became available as we arrived earlier then expected. 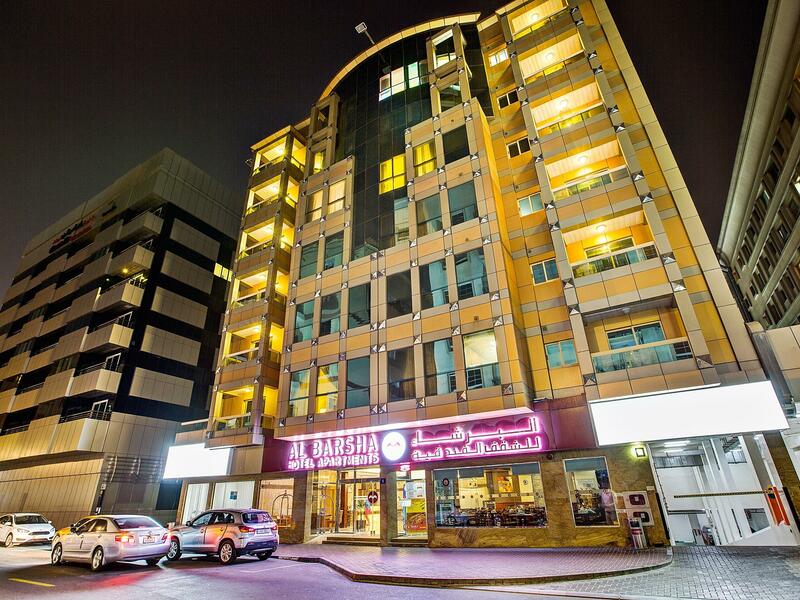 The hotel is less the 50m from the metro station and a 10min walk to the mall of emirates. สถานีรถไฟใต้ดิน Sharaf DG - ระยะ 0.12 กม.